Missing a beloved family member or friend? Need the confidence to be your most magnificent self? 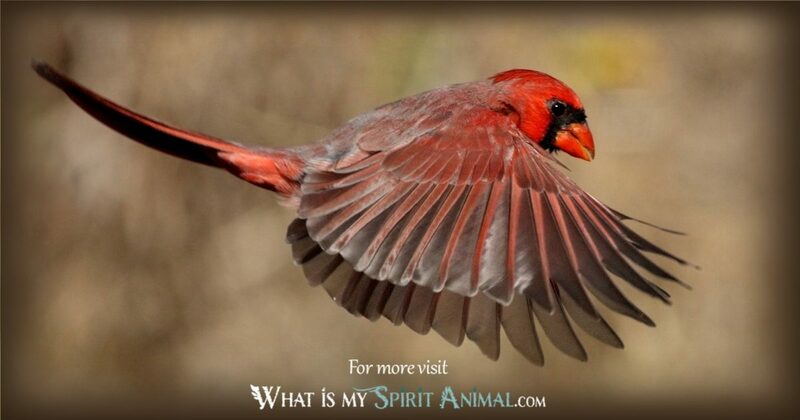 Cardinal as a Spirit, Totem, and Power Animal can help! 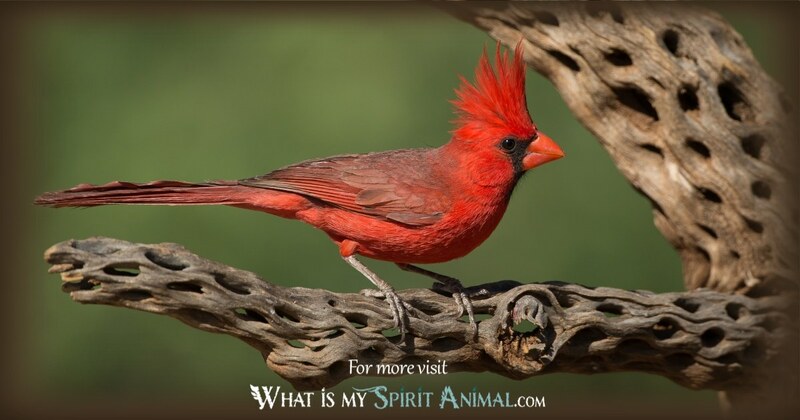 Delve deeply in Cardinal symbolism and meaning to find out how this animal spirit guide can support, strengthen, and inspire you! The bright red color of this member of the finch family along with its sharp song both add to the symbolism and meaning behind Cardinal. The bird is particularly focused on in Christian tradition where it represent the eternal nature of our soul and the sacrifice of Christ. It’s interesting that the Latin term for Cardinal means pivot or hinge. That said, these birds are named for the Cardinals of the Catholic church, with their brilliant red robes. Cardinals in nature mate for life. They’re also home bodies staying close to home throughout the year. This gives them strong ties to devotion, nurturing, and love. As Cardinals are ‘year-round’ birds, their Numerology association is Number 12 – the number of perfection and completion. Seeing Cardinals is considered particularly fortunate for relationships because we want those we love to be with us through all seasons or ‘year-round’. Only the male of the species bears the intense red with which these creatures have become associated. Interestingly enough, the brighter the red in Cardinal Spirit’s feathers, the more apt he is to capture the lady of his dreams and mate. Who would have known that Cardinal is such a Romeo! Beyond being Mr. Romance the male Red Cardinal shows pluck in defending his home and what they consider personal “space”. Do not mess with this guy in his territory. Considering symbolic value and bird medicine here, Cardinal becomes a fierce guardian spirit animal. The Cardinal song is delightfully varied. Bird watchers tell us they hear certain whistles that sound like the word “cheer”. What a wonderful message to spread throughout the woods and regions where Cardinal dwells – be of good cheer! This is an energetic, life-loving song that boosts any weary soul. Cardinal couples sing together, as well as singing songs to each other. If you are in a relationship this symbolizes both unity and diversity – the things so important to a healthy, loving balance. Sing together, particularly in difficult times. Sing to each other of your feelings, desires and dreams. Remain faithful and attentive and your relationship has a great future. Light workers describe the Red Cardinal as a bird with an objective. This animal spirit guide reminds us to watch for opportunity and think deeply about our purpose in the greater scheme of things. Red Cardinals in particular are considered feminine in nature, focusing our attention on the vivid side of the Goddess, the Sacred Feminine and life giving blood at the time of birth. 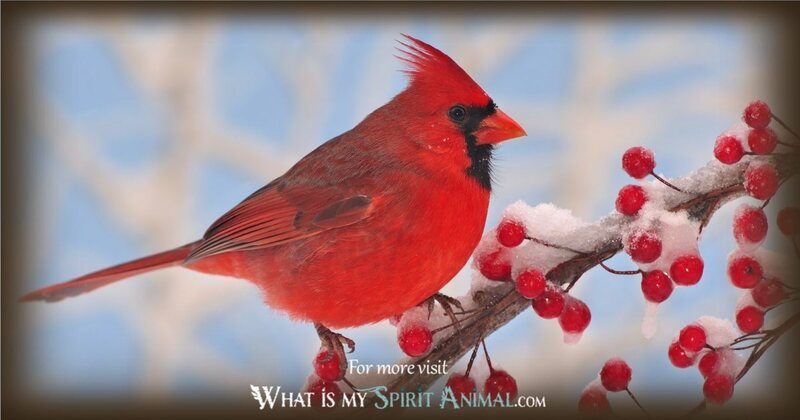 Cardinals also represents our intuitive and inventive nature that we may otherwise overlook. 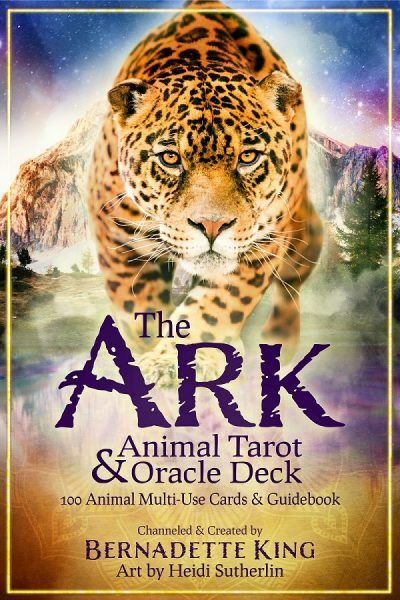 When the Cardinal Spirit Animal wings its way into your life, you may be on the event horizon of a new relationship complete with romance and some sensual overtones. There’s music in this partnership so tend it joyfully. Alternatively Cardinal may show up at the beginning of a pregnancy as a guardian and guide to handling your new role as a parent effectively. As with other birds, Cardinals teach us about the wind and where it takes us. There are times to fly and times to stay firm; wisdom comes in knowing the difference. The distinctiveness of Cardinal’s song also brings lessons about finding your own distinctive voice and keeping it true to self. Another lesson of the Cardinal Spirit Animal is about recognizing your power and place. Cardinal is a blessing to those struggling with insecurity and those striving for self-empowerment. Cardinal shows you how to fight the good fight until you reach your goal. Finally, because of the Red Cardinal’s symbolic meaning of ‘blood ties’ when this animal ally appears to you in person, dreams, movies, TV, songs, books, magazines, or even in conversations with others it could absolutely be a visitation from a loved one who’s crossed over. Those born with Cardinal as a Totem Animal have the medicine of uniqueness. There is no way Cardinal people can hide in a crowd. Either they dress festively with a love of bright colors, or their voice is so distinctive you cannot ignore a word. If you have Cardinal as an Animal Totem you have a strong sense of honor and know how to pick yourself up after setbacks. You have a natural aptitude toward innovation and determination. Whatever “it” is – you stick things out until the very end. Like the Cardinal spirit, you love your home. You have little patience for anyone who abuses your hospitality or overstays a welcome. Anyone deemed dangerous to your territory is NOT welcome. Cardinal people have both fortitude and courage to back up their song with actions. You are generally happy and other people enjoy your upbeat attitude. There are any number of great reasons for calling upon Cardinal as a Power Animal. 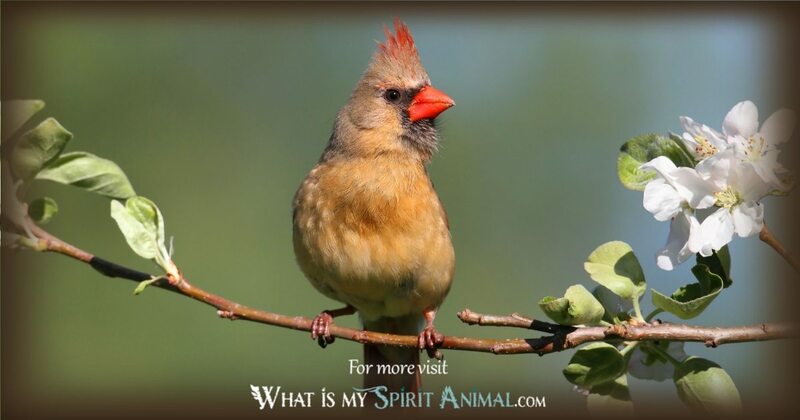 People just settling into a new home or work space find that Cardinal an excellent animal spirit guide for traversing and protecting their territory effectively. If you are someone who struggles with seasonal emotional swings, Cardinal is a year-round helpmate that helps you adjust to the ebb and flow in both weather and life. The Cardinal power animal assists with other matters of health and vitality too. Those who find themselves hesitant to speak to potential partners can reach out to Cardinal for both confidence and the right song for wooing (or minimally getting one foot in the door). Other goals for which Cardinal Power Animal lends energy include: clarity, joy, uniqueness, improved communication, dutifulness and preparedness. Among Native Americans most birds have strong ties to other realms and as such become messengers from the Great Spirit or the Ancestors. Cardinal in Native Lore represents loving relationships and devotion. The southeastern tribes associate Cardinal with the Sun and good fortune. And some tribes tell us that Cardinal is the harbinger of rain. When Cardinal appears in dreams it’s usually regarded as a positive message, one that urges you to follow your dreams and passions. Something good is on the horizon. Some dream experts also feel Cardinal may represent a loved one who has passed over sending you a message. In the Far East, particularly China and Japan the “red bird” appears as the mythical Phoenix, the bird of fire, transformation, rebirth, fidelity and integrity. The Red Bird heralds the coming of new horizons, be it the end of a war or the anointing of an honorable ruler. In China, specifically, Cardinal (Red Bird) guards the southern quarter of creation where it stands watch over evil influences. Thank you for your in-depth piece on the Cardinal.